The State of Arizona has a birth records from 1887 - 1931 and death records from 1878 - 1956 available for free searching with ease utilizing the sites search engine. This website is user friendly allowing you to search with just the surname and if you prefer you can add more information such as the given name, the year and county of birth or death. Generally the birth records will give you information regarding the parents names, residence, occupation, and nativity. The death records contain the normal information included on a death certificate including the last residence, cause of death, birth date and place, parents names and nativity. You will need to have Adobe Reader installed on your computer to view these documents. The Adobe Reader program is easily attainable for free by clicking here to be directed to the Adobe website to download and install the Adobe Reader program to your computer. I have also provided a link to the Adobe Reader Page on my links tool bar. This program is free to download and install and works with many websites that require the reader program. 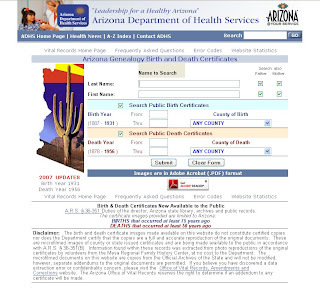 To access the Arizona Birth and Death Records Online, click here.